Years lived in: About one month! We moved at the end of August. 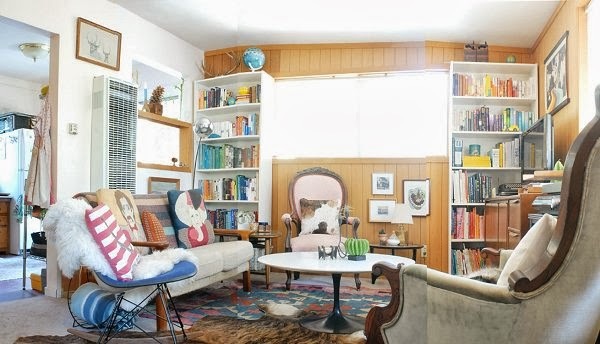 Define Your Style: Hmmm.... colorful artsy eclectic mid century modern? That's a mouthful. 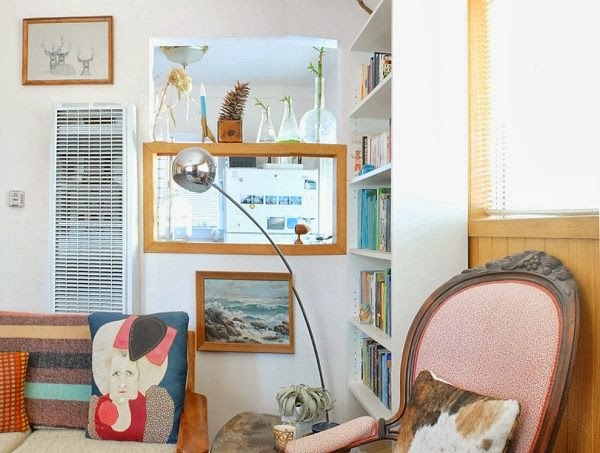 An explanation: we love lots of art and lots of color, we have a penchant for mid century and Danish modern design, but we also like to mix in other vintage pieces from various eras. 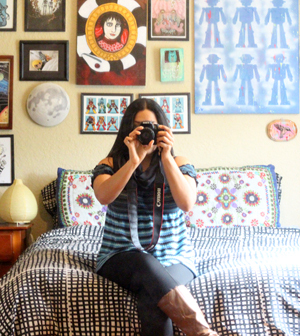 What inspires you with your home space? We are both trained as artists, Chris in photography and me in studio art/painting, and that perspective has been key to amassing our collection of vintage and new art. Chris is always putting together various objects to make little sculptures, and I think of styling our home like putting together a good composition. 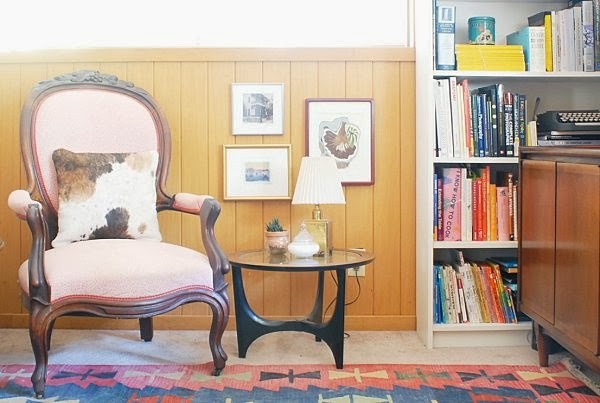 I also read too many home design blogs, and I particularly love everything Emily Henderson does. We're always finding and learning about new (vintage) things we didn't even know existed, and adjusting our space accordingly. 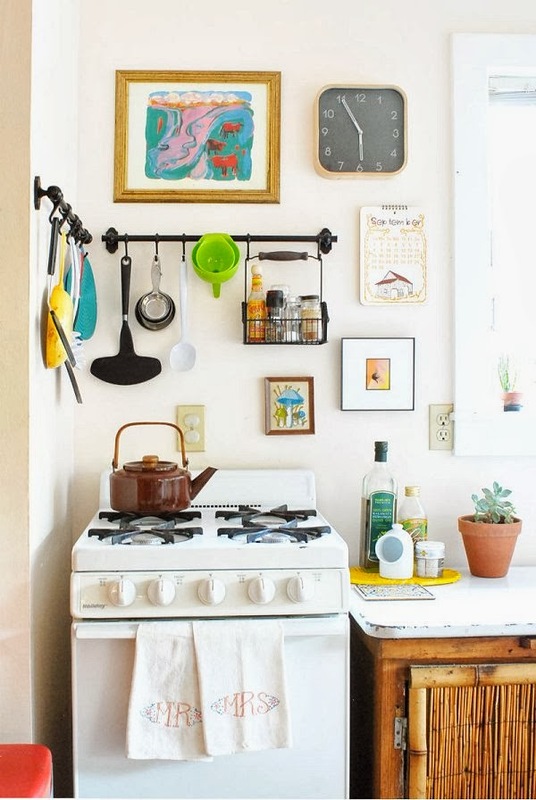 Favorite element of your home? 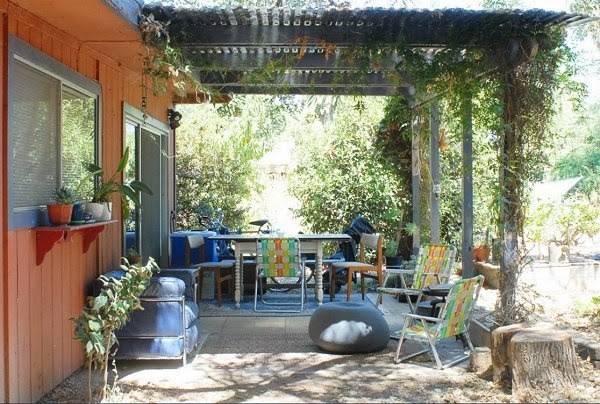 We absolutely love having a large outdoor space, especially now that we live in a climate where we can be outside year-round. The only catch is we don't really have any outdoor furniture other than some cheap aluminum vintage folding chairs, so it doesn't quite fit in with the style of the rest of our home yet. Luckily our patio is covered, so we keep some indoor furniture out there, like our enamel table and even a few rugs that make it feel like a real room, but we could really use some better outdoor furniture to class it up. Biggest challenge? Three walls of wood paneling in the living room. Oh man. It's actually really nice wood paneling from what I can tell, like it seems to be good quality, but it's just a whole lot of wood for one room, and we're not allowed to paint it. Part of the issue is that the paneling instantly dates the room, so we had to reevaluate how we decorate. Friend's reaction when they enter? My favorite reaction ever was when our new neighbors-turned-friends first stepped into our living room of our first California apartment (we only lived there for a month due to an insanely crazy landlord situation). They both freaked out, it was hilarious! That's not exactly normal, but we do always get good reactions from friends when they see our space for the first time. We have so much art and little things to look at, people usually end up walking around looking at everything up close and asking us to tell them about it. Biggest Embarrassment? There's always somewhere in our apartment that becomes the extra stuff dumping ground. In our current place it's our second bedroom. It's a small room in the first place, but there's just so much stuff that needs to be stored somewhere, and we don't have an attic, basement, or garage where we can hide all of it. I really don't want to pay extra to get a storage unit, but it's a little embarrassing to have such an ugly, full-to-the-brim room! Proudest DIY? My felt ball garlands. I originally made natural white ones, which we hung on our Christmas tree last year, then I made more in our wedding colors, which we decorated our reception with, and now we use all of them as a faux headboard for our bed! Biggest indulgence? Vintage globes! What a weird indulgence. We have a globe problem, but we just can't stop. We have sold a lot of them, both on Etsy and at several moving yard sales we have had this year, but we still own at least nine. Best money-saving move? Buying [just about] everything used! We're definitely saving money on all the furniture and decor stuff, but it's really the everyday stuff I think is important for keeping overall costs down. We also buy all sorts of normal household stuff at estate sales, like gardening supplies, cleaning supplies, even canned food. You can get good stuff at estate sales, since they're literally clearing out everything that belonged to someone who has died. Best Advice? Only buy something if you really love it (or need it, in the case of household stuff). We've gotten around this a little bit by buying some things to resell, but in general I always try to follow this rule, especially since we have to shop so much to keep on top of all the good stuff at thrift stores. Dream Source for home goodies? 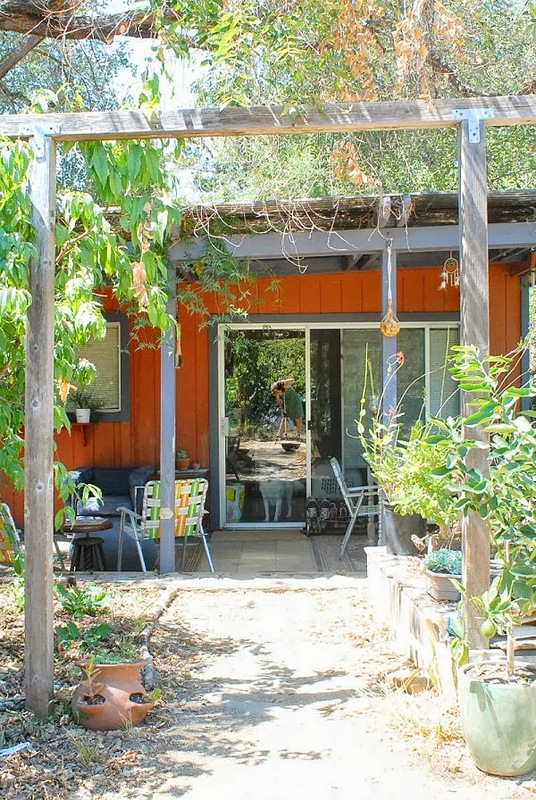 We can't wait to go check out the Rose Bowl Flea Market now that we're near LA. What's your favorite element of Chris and Julia's brand new living space? 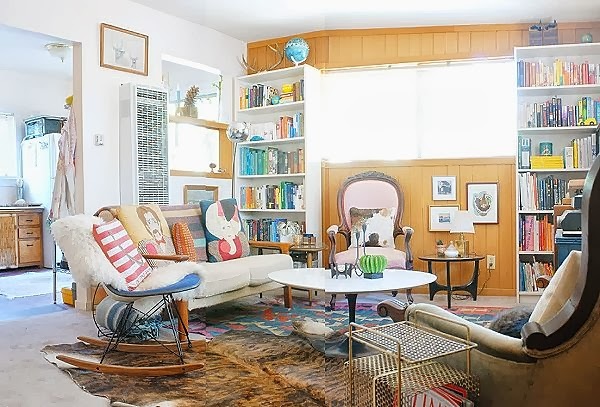 I'm actually in love with those wood paneled walls, goes with all the vintage they own and they really made an initial challenge add to the space! This space is stunning! Thanks for sharing. YAY! Thanks so much for featuring us, Van!! You're welcome, thanks so much for all the helpful info! I have to say that the paneling was not so much noticeable because of the décor. I know they said they didn't care for it, but I thought it worked! Its the stigma of the paneling. but when I read that they didn't care for the paneling, I was thinking "what paneling?" and I had to scroll back to the picture to see it. I didn't notice it at first because I was looking at the rest of the room. 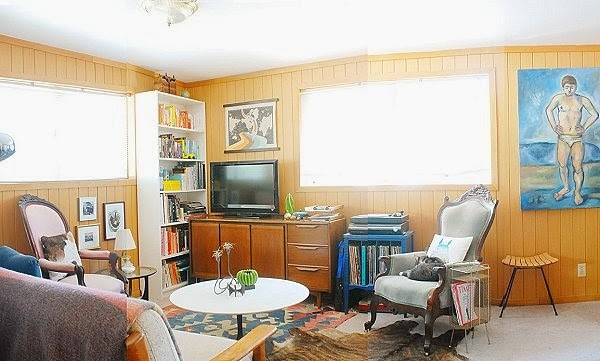 I love wood paneling, I can't wait to share a before/after of my boyfriend's completely wood paneled (ceiling and walls!) sunroom. I'm moving my merchandise out of it today and want to help him turn it into a man cave. Love this and all the house tours. Thanks, I love doing them. Can't wait to snap photos of more local pads/my nerd and art pal's pads. Lots of fun comic book, art, and other collections coming up next! THAT would be lovely! :D A Living Space has to invite us all down now. Yes, the pillow are glorious! My hoarder room was at my boyfriend's house but it's being dismanteled and incorporated back into my home today, uh oh! ;) But yes, a reseller/collector will have to sacrificed SOME portion of their home, always. My kitchen pantry and left side of my bedroom closet will be the victims. I thought the same thing: "What paneling?" Great job in making it look like it belongs! 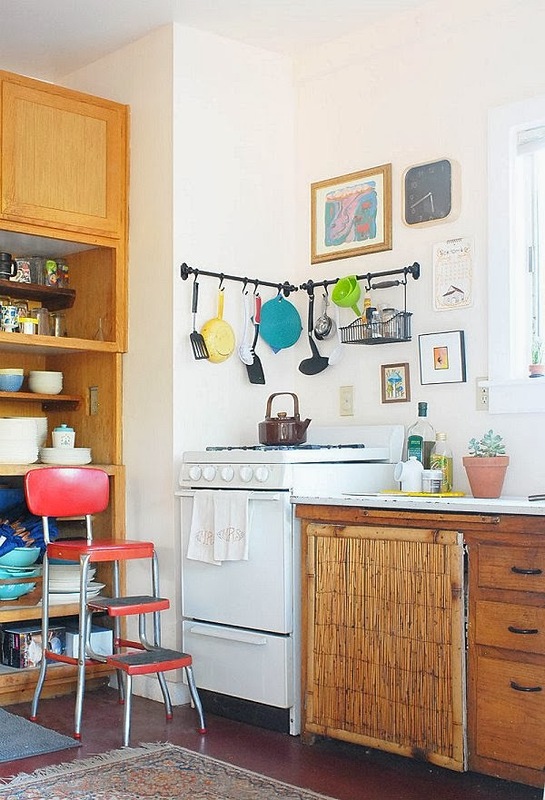 That's a good decorating trick-- don't fight it, incorporate it. 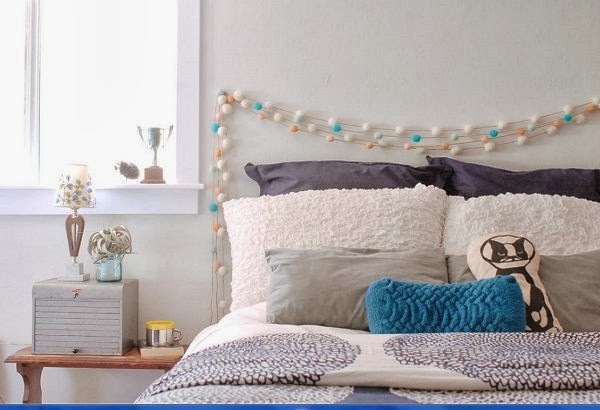 Love the felted garland above the bed! Also love the natural light. All of my former apts were like caves! Hated it! That does take some skill right there! 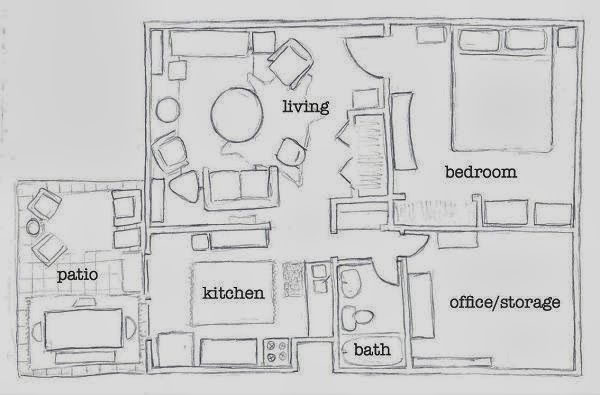 I'm lucky to have all my apartments be extremely light-bathed, it does present it's own problems with layout when nearly every wall is mostly windows though! yes! what an amazing house! and it makes me feel better to know their second bedroom is full of boxes too. my husband always shows that room off when we give people a tour and i hate it! Mine would have been if my roomie didn't come to live here. It's for the best! :D It's forced me to creatively incorporate merchandise into my house and really stuff my booth, too. Always love to see what these two come up with (my brother and sister-in-law!). I've always been more than willing to take some of their "hoarder stuff" off of their hands for them over the years. Can't wait to go see the new living space for myself! Their home is lovely- inside and out. dream house! 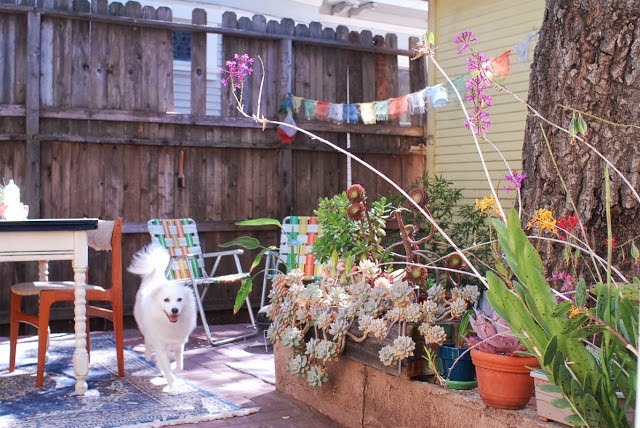 i love the outside space. perfect seating - and those tree stumps!! !